After nearly a year of planning, my quest for a Rio Grande turkey was about be realized. A late night Internet search provided me with the website of Elkhorn Creek Outfitters in Ellsworth, Kansas. Phone calls were made, flights were booked, and cars were rented. We were all set to go. On April 12, 2003, Bucksnort Pro Staffer, Craig Sleeman and I checked into the Rochester Greater Airport and our long awaited Rio hunt was now a reality... almost! We experienced a 4.5-hour delay in Chicago. We took this like champs as nothing could damper our spirits. At 6:00 Pm, We picked up our rental in Wichita and drove 1.5 hours to Ellsworth. Craig spotted many turkeys along the way and we could tell by the tan/gold hue of the feathers that we were indeed in �Rio Country�. Our excitement peaked as we drove into the driveway of the Elkhorn Lodge and a flock of 15 Rios greeted us. Upon arrival we met our guides, owner operator Scott Bohl and Heath Barta. There was sufficient light to roost some birds, so off We went. I rode with Scott and Craig paired with Heath. Scott took me to three roosting sites and 2 out of 3 produced gobbling as well as a bonus coyote serenade. We all met back a the lodge, which was a 2 story farm house decorated with many large whitetail racks, turkey fans, and a bobcat skin rug and enjoyed a full course lasagna dinner prepared by Scott�s wife, Sara. After lots of conversation, We turned in for the night and dreamed of strutting gobblers as the alarm was set for 5:00 AM. Scott drove us to a location that was only 2 miles from the lodge. We had an easy walk across a low alphalfa field and quickly set up in a thin finger of the field. With 2 hen decoys set straight to our left, the birds would have option except to travel right to us at fly down, if Scott�s predictions were correct. After a few soft tree yelps, a nearby � GRRRAABBBBBLLEE� was heard. A pack of coyotes chimed in and the gobbler really started to gobble. In fact, he preformed the rarely heard quadruple gobble from the roost. I heard some hens in the trees, and then it happened... the Fly down! The birds flew directly at us and landed well within gun range. The beating of wings against tree limbs could be heard as bird after bird pitched down to the alphalfa. The birds strutted immediately and I strained in the early light to detect beards. I counted 15 birds and some were only 15 yards away. The flock now started to walk right past the decoys. Basically, I had my pick of the bunch. Although he did not strut, I noticed that one mature bird sported a beard longer than all the rest. I declared him to be mine and let my Remington 870 claim the prize. I placed his head in the Simmons Pro Diamond scope and the 3� Federal # 5�s anchored the bird at 24 yards. The bird weighed 18.25 lbs. He featured sharp 1� spurs and an 8.25� beard. He scored 55.5. Even after the shot, the rest of the flock remained in sight and some jakes actually came in to investigate our calling. Although Kansas laws allow for 2 birds to be taken in a day, we passed on these birds and looked forward to more long beard action. The birds were henned up and quite hard to call in. At one point, We called in 2 mature Toms. However, 2 hens appeared and the show was over for the day. Having roosted a flock the night prior, We decided to venture back the next morning with hopes of another successful fly down hunt. Our plans worked perfectly as 13 birds approached our set up. Unfortunately, no mature long beards were in this flock and we let these birds pass at 30 yards. Back to the truck we went to locate some birds strutting in the fields. Scott spotted 4 birds creek side and 2 of them displayed full fans. �There are you birds� He stated. We parked and made a stealth walk following the terrain and set up 100 yards along the dry creek bed. As we nestled down against a tree and emitted some clucks, We could see the hens approaching. In tow were 2 mature Toms. What an opportunity for me! I was about to have my pick of 2 mature Rio long beards. As it turned out, the last bird sported the longest beard. With the Simmons Pro diamond positioned on his red head, the Remington 870 performed again. This time from 27 yards away! As we drove back to the lodge, I wondered if Craig had similar success. For if he hadn�t, I�d be able to join in his hunts and take along my video camera to capture the memories. That is exactly what happened and the account of Sleeman�s hunt can be found in his article. The Kansas Rio Adventure was one of those rare vacations where everything seemed to work out for the best. 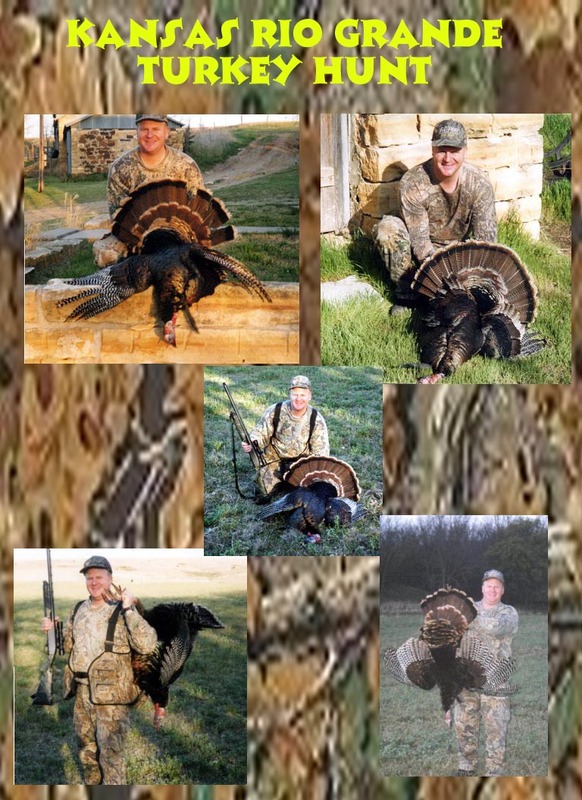 Put together a comfortable lodge, great cooking, friendly guides, cooperative birds, nice weather and you have the turkey hunting experience of a lifetime.